Garrett Neese/Daily Mining Gazette John Wyrzykowski, a third-year mechanical engineering major at Michigan Technological University, tries out Unite’s Arrive Alive drunk-driving simulator as Unite’s Mike Vega watches his progress on a monitor. 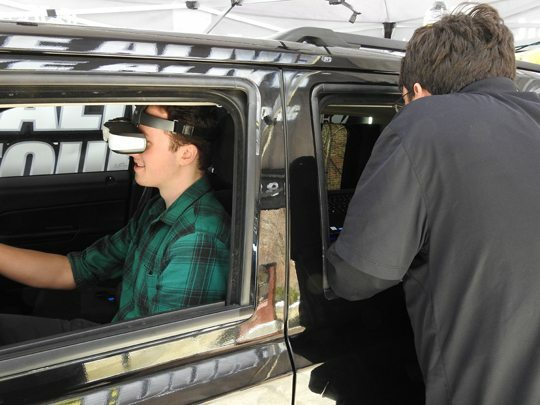 A driving simulator came to Michigan Technological University’s campus Friday with a message: You don’t. Unite’s Arrive Alive Tour brought a computer driving simulation that through delayed reaction times and blurred graphics simulated the effects of drinking. After a couple of successful passes, he hit an oncoming vehicle, signaled by a cracked windshield. Unite has three teams, covering about 50 locations a season — high schools, colleges, military bases and medical centers. Even beyond the possibility of injury or death, the group is trying to convey the economic risks, too. A conviction could cost people around $15,000 in court costs and legal fees, said Ayron Austin of Unite. They also have a simulation showing the dangers of texting while driving. “This gives a really nice hands-on activity way of doing it, instead of saying, ‘Hey, don’t do that,'” Austin said. Second-year environmental engineering major Emily Rutledge was one of the students who tried it out.